Description taken from Goodreads. I received an advance copy of this book, to be published April 7th, 2015, via the publisher in exchange for an honest review. These opinions are my own. I read and loved Ann Aguirre’s RAZORLAND series, but this was the first time I’ve ever read her contemporary. There’s only really one word to describe it, and that is amazing. It’s not only the beautiful cover, or the post it notes that look real. It’s this story. First of all, if you aren’t into gritty fiction, then you should read this book. Second of all, if you are into gritty fiction, then you should read this book. There is not category for this story. It can be labeled a contemporary, but it’s gritty without being gritty the way that Nancy Werlin and Ellen Hopkins’ contemporary is. It’s not bitter, resentful or overplayed the way that books about people with scars can be. If I had to relate it to anything, I would say it gives me the same sort of feeling as Katie McGarry’s novels. THE QUEEN OF BRIGHT AND SHINY THINGS is intense. It’s also cheesy and angsty at times, which I didn’t love so much about it, but overall the feelings I got from it made it okay. What makes this story so great is also the reason why a lot of people didn’t like it, and that is the characters. When first introduced to her, Sage seems almost fake by how good and nice she seems. She puts post it notes on other people’s lockers just to hope that they have a better day than the one they’re having, and she embraces the mockery that comes her way. But Sage and Shane are anything but just sweet and one-dimensional. They’re actually kind of crazy. Sage and Shane are both incredibly real and relatable. They’re sweet, but destructive. They’re open but closed off. I loved how complex they were and how much I grew to love them both. They’re extremely different from the characters of the Razorland series, and I love the way that Aguirre has taken this story. On top of Sage and Shane and the amazing way they fall in love, there’s Aguirre’s writing. Lots of great banter and some pretty awesome passages, especially towards the middle and the end. Lots of laughing and crying should be expected from this book. It’s hopeful, beautiful and heart wrenching all at once. Shane and Sage are the kind of friends that people dream of having, and they’re perfect for each other at the same time. 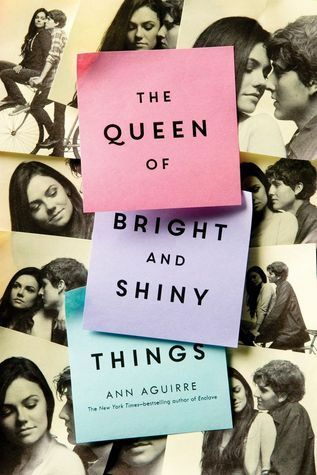 THE QUEEN OF BRIGHT AND SHINY THINGS had an awesome ending, the perfect cherry on top of this roller coaster of a story. Would recommend in general, but definitely for fans of Natalie Standiford’s HOW TO SAY GOODBYE IN ROBOT. 4.5 stars.